The Saint Bernard is a laid back and relaxed breed. It is tolerant and calm with children, but not highly energetic or active. Although often in slow motion, this breed is committed to its family and eager to please. On occasion, it can be strong headed. The Saint Bernard requires daily physical activity so that it remains physically healthy and does not become overweight. These needs can be satisfied through a walk, a jog, or a short run. The Saint Bernard does not thrive in the heat and does best in a cold to mild temperature environment. This breed flourishes when raised in an outdoor environment, but can do well as a house pet as long as it has the opportunity to venture outdoors into a yard. The coat of the Saint Bernard requires moderate maintenance, with brushing once each week. As a puppy, if this breed becomes overweight, it may quickly develop hip issues. All Saint Bernard’s have a tendency to drool. Some of the major health concerns for the Saint Bernard are CHD (canine hip Dysplasia), gastric torsion, ectropion, and elbow Dysplasia. There are also minor health concerns for the Saint Bernard which include OCD (osteochondritis dissecans), diabetes, heart conditions, cardiomyopathy, and bald spots. Occasionally seen in this breed is distichiasis, which affects the eyes. It is suggested that regular testing of the hips, elbows, eyes, and cardiac system occur to keep this breed health. The average life span of a healthy Saint Bernard is 8 to 10 years. The heritage of the Saint Bernard is embedded in Roman Mollosian dogs. Sometime between 1660 and 1670 the breed progressed into a dog that was capable of saving the lives of others. During the same time period, these dogs made their way to the St. Bernice Hospice. These dogs assisted in pulling carts and as a watchful eye. Eventually the monks used these cold weather tolerant large dogs to create pathways during snowfall. The reputation as life savers came from the ability to locate missing persons in the snow and revive the person by licking their face. These dogs are credited with saving more than 2,000 people over a few centuries. A Saint Bernard by the name of Barry is the most well known and is said to have saved the lives of 40 people. These dogs were originally known by various names including Hospice Dogs, but after the famous Barry passed away, they became referred to as Barryhunds. Harsh weather and the spread of disease lead to the demise of many of these dogs at the beginning of 1800. In 1830, a few of the dogs that remained were crossed with Newfoundland’s to create the long-haired Saint Bernard. This new long-coated feature acted as a setback in their ability to brave the cold, as ice would form on the long hair. 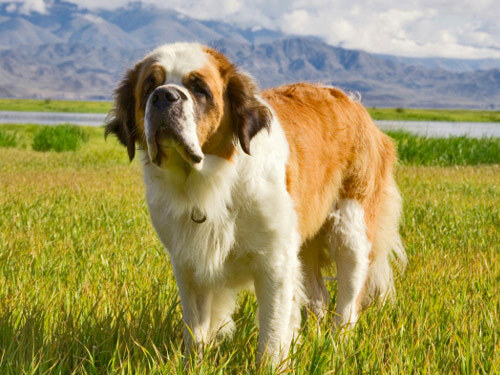 In 1810, the Saint Bernard made its way into England by the name of the Sacred Dog. The name Saint Bernard became official in 1880, although it was commonly used from 1865 onward. Around the time that the name became official, the Saint Bernard attracted attention in America and became increasingly popular there by 1900. Today it remains one of the more popular large breeds.